SMS Tech offers a wide range of features for sending SMS from your computer. However, its SMS pricing is at the more premium end. It is therefore with exploring their wide range of benefits of their features, reliability and reputation with charges when considering engaging SMS Tech as an Email to SMS provider. SMS Tech offers an impressive array of text messaging tools and a very basic practical two-way of sending from your computer (email to SMS) direct to your mobile. Easy! It has tools for the delivery confirmation and auto-respond, which are well suited to the needs of small businesses. The Email to SMS British Provider Comparison Table provides you with its range of features. SMS Tech helps you find the most effective way to reach current and potential customers for your business as simple as writing an email to sms from Outlook. This Email to SMS gives you access to vehicles like adding contacts for future marketing as well as you can send to your customers. You can also opt for audit trail and this will record all messages sent and received through your email server. This service suits single direct messaging (via email to SMS) rather than group messaging. Email SMS allows you to send SMS messages using almost any email program. With email to SMS it is easy to include text message delivery just by adding the contacts mobile number in our email to SMS format – there’s no additional software required. SMS Tech’s service also allows the client to send one-off SMS from their email account to a mobile phone. This means they can also receive replies back in the form of an email into their inbox. SMS Tech’s features essentially builds a bridge between you and your clients, creating a two-way dialogue with contacts. The initial campaign will help you send out direct texts to people who have signed up for your service, but you can expand on basic text messaging by sending auto-responses. With SMS Tech you can also set up schedules to deliver text messages to your customers on a regular basis or at a set time. When comparing SMS Tech features to other comparable Email to SMS Providers in UK, it can be seen from the graphical representation below that SMS Tech rates very highly in terms of the features it has to offer present and prospective clients. With a rating of 86 out of a 100, it is close in high standard of features, nd very comparable to that of Click Send and SMS Broadcast. This indicates that SMS Tech offers the kind of range of features that would satisfy most clients in engaging their services. 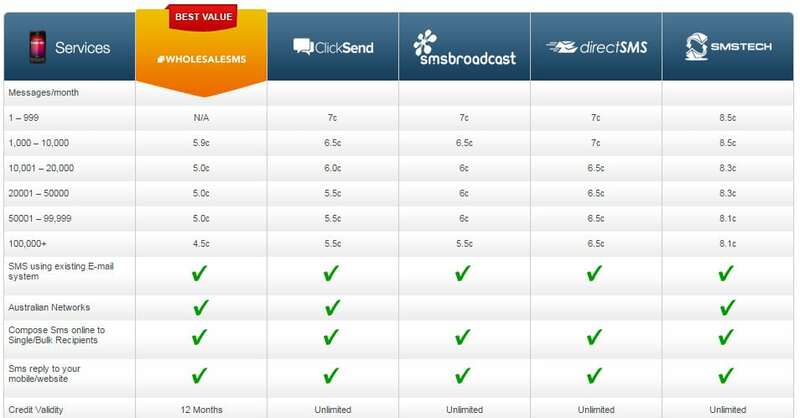 As can be seen from the Email to SMS Provider Comparison Table below, SMS Tech is by no means the cheapest SMS provider in UK. On all accounts dependent on volume distribution numbers, whether it would be smaller number or a large number of message distribution, it is most expensive compared to all the other SMS providers investigated. For example, on very small SMS distribution in a month, its rates are around 23% more expensive than the cheapest price available. Similarly, on large volumes, it is just over 40% more expensive than the cheapest provider for that volume size. By comparing the five main British SMS Providers prices on a rating of 0 to 100, where 0 is expensive in charges to 100 which offers extremely reasonable rates, SMS Tech ranks the lowest with a 58 out of a 100, as can be seen on the graphical representation chart below. It is more expensive that all the other competitors and reaffirms the chart above as offering services at expensive rates. Since it is the priciest company compared to all the other SMS companies that we have compared on the website, so take care and choose wisely. Other than that, you can call or email them to discuss their charges and you can expect quick response times. There are FAQs email, or you can contact the company via telephone or email. While there are very few questions on the FAQs page, you will find other information on matters ranging from privacy issues to delivery problems. Therefore one will need to consider and weigh the benefits of features, reliability and reputation when considering engaging SMS Tech as an Email to SMS provider. Our SMS Tech review from the Comparison Table provided found the company is customer service focused with their headquarters located in Melbourne. This will mean that there is an ease of communication within UK should there be a need for immediate response to all inquiries and resolve support issues from a customer service perspective. Although not providing a 100% gateway uptime guarantee, it does provide a near full service level agreement (ie. 99%) that ensures a near certain guarantee like reassurance. It should also be emphasised that it provides multiple gateways and routes through its national delivery system to all British carriers. When comparing the different Email to SMS Providers, one need to consider the easiest, most reliable methods of sending an SMS from your computer and taking into account the cost factor. Aspects such as Hybrid Gateway availability should also be considered before deciding on SMS Tech as a SMS provider. From the graphical charts presented below, it can be seen that with all its features and costs, it does not rate well with its British SMS competitors. It has the lowest rating of all the other Email to Text Message services. Our SMS Tech review based on the Comparison Table provided found this SMS gateway provider has a substantial market share competing with other players. By comparing the five SMS providers on the graphical representation below it can been seen that it has a rating of 81 out of a total 100 which indicates a well founded reputable company that delivers the products and services in has attracted companies to engage them. It serves some significant British clients such as World Series Paintball, Dragonfly are happy with this basic email to SMS service. With 99% SLA uptime guarantee and British Support, they also have an email query service from their website which is useful for those looking for more information. They provide instant web-based SMS sending from your browser; provides ready made scripts to help you connect to their SMS Gateway UK network and receive inbound text messages direct to your applications. However, as stated above, it is not the cheapest provider with a restriction on it credit availability compared to other competitors. These factors need to be considered when deciding on which company you wish to engage.